What a bumper month of poker April promises with events all over the globe including WPTs, partypoker LIVE, Unibet Deepstack Open, Super Stack and Cash Game Festival. 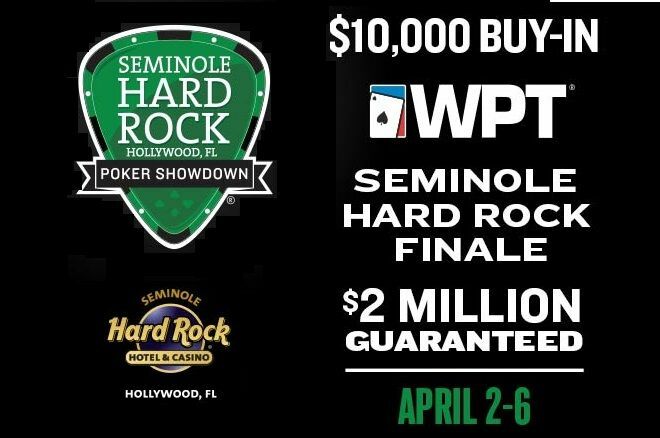 The WPT is reaching the climax of its 2017-2017 season with the $2m guarantee Seminole Hard Rock Poker Finale from April 2-6 followed by the season-ending WPT Tournament of Champions. The WPT will be kicking off its 16th season in April with running a brand new event and location. WPT Beijing will take place April 15-19 at the stunning NUO Hotel Beijing as part of the 2017 Ourgame Chess & Card Festival. A new WPT National event has been added to the calendar with WPT National Emperors Palace taking place in Kempton Park Johannesburg; the 12,500 Rand Main Event runs April 7-9. There are also two WPTDeepstacks events in April including WPTDeepstacks Maryland from April 14-24. The eagerly-awaited Partypoker MILLIONS takes place at Dusk Till Dawn in Nottingham from April 20-23. The MILLIONS event comes with a £6m guarantee – including a £1m guaranteed prize for the winner. Day 1s have been running online since October with Phase 1 events taking place at Dusk Till Dawn as well as at partner venues around the UK and across Europe. Among those already through to Day 2 are Liv Boeree, Dzmitry Urbanovich, Rainer Kempe, Ludovic Geilich, Martin Jacobson, Ollie Price and Stephen Woodhead. Live Day 1s at Dusk Till Dawn start on April 18. There is more partypoker fun to be had in Canada with partypoker Grand Prix Canada at the Playground Poker Club near Montreal from April 25 – May 1 while the inaugural €500,000 guaranteed partypoker LIVE Grand Prix Austria will be hosted at Montesino in Vienna from April 6 – 10. This first European edition of the partypoker LIVE Grand Prix has a direct buy-in of €200+€25. partypoker Grand Prix Dublin is the tour’s visit to Ireland in 2017 with a whopping €150,000 gte for the €300 + €40 Main Event which runs April 28 to May 1 at the four-star Clayton Hotel. In Europe, Super Stack Murcia is taking place Gran Casino Murcia from April 6-10 with a €170 buy-in for the five-day event. One buy-in and four re-entries are permissible per Day 1. After a great event in Cannes, the Unibet Deepstack Open tour is heading to beautiful Saint Amand les Eaux near Lille from April 6-9. Don’t miss the chance to visit the stunning capital of Estonia when Cash Game Festival heads back home to Tallinn. The five-day event runs from April 26-30 with a live stream on Twitch. The festival has another event planned for May with Cash Game Festival Gibraltar onboard the stunning Sunborn Yacht Hotel & Casino from May 17-21. The beautiful Mediterranean island of Malta is the next destination for the MPN Tour which is hosting a fantastic event at Casino Malta from April 27-30. There’s plenty of fun to be had in the UK too. Grosvenor Casinos’ 25/25 Series has events in Bolton and Southend, both running April 6-9. UK poker stars of the future will be vying for top prizes at the Grosvenor UK Student Poker Championship at the Ricoh Centre from April 18-23. The GUKPT heads to Walsall at the end of the month with a £100k guarantee for the £550 Main Event from April 23-30. There are two Mid States Poker Tour events on in April: MSPT Milwaukee at Potawatomi Casino in Wisconsin runs from April 1-9 with the $200,000 guarantee Main Event starting on April 7. Later in the month, its’ the MSPT Minnesota. The festival runs from April 21-30 with the $200,000 guarantee Main Event starting on April 28. Exotic climes are promised with the Card Player Poker Tour, a series of live poker tournaments started by the publishers of Card Player magazine. The tour features live web broadcasting of its final tables, as well as a players’ points system. The tour heads to the Caribbean for the St. Maarten Maho Poker Classic from March 30 with the $1,100, $100,000 guarantee Main Event starting on April 7th. The first-ever global PokerStars event in Macau, previously home to the popular Asia Pacific Poker Tour events, started March 30 and runs through to April 9. PokerStars Championship Macau promises bright lights, unique culture, glamour, glitz, and a host of big-money poker tournaments.